Linz is the third-largest city of Austria and capital of the state of Upper Austria ( ). It is located in the north centre of Austria, approximately 30 km south of the Czech border, on both sides of the river Danube. The population of the city is 189,343 (2007), and that of the Greater Linz conurbation is 271,000. It was a provincial and local government city of the Holy Roman Empire, and an important trading point connecting several routes, on either side of the river Danube from the East to the West and Bohemia and Poland from north to the Balkans and Italy to the south. Being the city where the Habsburg Emperor Friedrich III spent his last years, it was, for a short period of time, the most important city in the empire. It lost its status to Vienna and Prague after the death of the Emperor in 1493.One important inhabitant of the city was Johannes Kepler, who spent several years of his life in the city studying mathematics. He discovered, on 15 May 1618, the distance-cubed-over-time-squared — or 'third' — law of planetary motion. Kepler is the namesake of the local public university . Another famous citizen was Anton Bruckner, who spent the years between 1855 and 1868 working as a local composer and church organist in the city. The local concert hall "Brucknerhaus" and a local private music and arts university are named after him. Adolf Hitler was born in the border town of Braunau am Inn but moved to Linz in his childhood. Hitler spent most of his youth in the Linz area, from 1898 until 1907, when he left for Vienna . The family lived first in the village of Leonding on the outskirts of town, and then in an apartment on the Humboldtstrasse in Linz itself. Hitler's parents are buried in Leonding. To the end of his life, Hitler considered Linz to be his "home town", and envisioned extensive architectural schemes for it, wanting it to become the main cultural centre of the Third Reich. In order to make the city economically vibrant, Hitler initiated a major industrialization of Linz shortly before, and during, World War II. Many factories were dismantled in the newly-acquired Czechoslovakia and then reassembled in Linz, including the Hermann-Göring-Werke (now voestalpine ). In addition to an ordnance depot, Linz has a benzol (oil) plant which was bombed during the Oil Campaign on 16 October 1944. The Mauthausen-Gusen , located near Linz, were the last Nazi concentration camps to be liberated by the Allies. While in operation, they were the source of quarrying for stone for Hitler's prestige projects across the Reich. The main camp in Mauthausen is just away from Linz. After the war, the river Danube that runs through Linz — from the western side to the south-eastern side — which separates the Urfahr district in the north from the rest of Linz — served as the border between the Russian and American occupation troops. The Nibelungen bridge that spans the Danube river from the Hauptplatz (main square) was at that time Linz's version of Checkpoint Charlie . The Nibelungen Brücke with the two bridge head buildings is the only architectural plan Hitler ever carried out in Linz. Linz also serves as an important transportation hub for the region of both Upper Austria and, to a lesser degree, southern Bohemia. The "Blue Danube" Linz Airport lies about 6.25 miles (10 km) southwest of the town centre. Direct flights include Frankfurt , Düsseldorf and Vienna with additional seasonal routes added during the summer and winter months. Ryanair flies to London Stansted Airport . Brucknerhaus — the concert hall named after the composer Anton Bruckner, who was born in Ansfelden , a small town next to Linz. The city is now home to a vibrant music and arts scene that is well-funded by the city and the state of Upper Austria. Between the Lentos Art Museum and the "Brucknerhaus", is the "Donaulände", which is also referred to as "Kulturmeile" ("culture mile"). This is a park alongside the river, which is used mainly by young people to relax and meet in summer. It is also used for the Ars Electronica Festival and the "Linz Fest". Linz has other culture institutions, such as the Posthof, which is near the harbour, and the Stadtwerkstatt , which is by the Danube river.Linz is the European Capital of Culture in 2009, along with Vilnius , the capital of Lithuania . 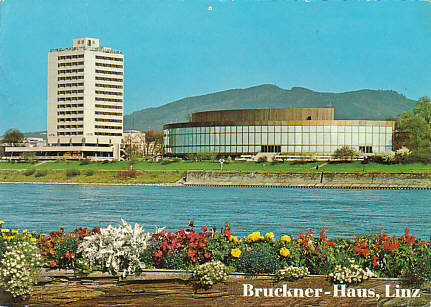 The Brucknerhaus , the most important concert hall in Linz is named after Anton Bruckner. It is situated just some 200 meters away from the "Lentos". It is home to the "Bruckner Orchestra", and is frequently used for concerts, as well as Balls and other events. Amongst the many "Gymnasien" (high schools) in Linz, is Linz International School Auhof , which is one of four IB (International Baccalaureate) schools in Austria, and uses English as main language for instruction. Andrew Edge (born in Leeds , England) musician. Doug Hammond (born in Tampa, Florida , 1942) musician. Klaus von Pervulesko (born in Innsbruck , 1945) actor.